Since we haven’t come out with any new material this month (next month should be a different story), here’s an older piece by Donald Parkinson critiquing Maoism and the role of Mao in crushing ultra-left opposition movements in the Great Proletarian Cultural Revolution. The Great Proletarian Cultural Revolution is claimed by many Maoists as the highest point of communism in the history of mankind. Maoists such as the RCP and Kasama and even anarchists like Michael Albert see the event as evidence of the liberatory potential of Maoist thought. Much of the New Left in general was enamored by the events in China and radical newspapers from the era are full of Mao portraits and quotes from the Little Red Book. “It is right to rebel” being taken up as a slogan made the Maoists seem like they were more anarchist than the anarchists, the “hardest” of the revolutionaries. To call what happened during the years considered the height of the GPCR (66-69) a revolution, nonetheless a proletarian one, is certainly a misnomer. A more apt description would be that it was a bureaucratic power struggle that in many cases got out of hand. Gaps in authority were certainly created by Mao’s chaotic tactics of consolidating power and workers certainly took advantage of these gaps in authority. But in the end Mao’s Cultural Revolution wasn’t much different from Stalin’s – an attempt to solve the problems of socialism-in-one-country through purging the state leadership of corrupt “capitalist roaders” rather than changing the social relations that led these corrupt positions to develop in the first place. Marxist-Leninist dogmatism claims that the expropriation of the bourgeoisie, nationalization of property and establishment of central planning under the rule of party eliminates the basis of class antagonisms. Yet it was clear that China in 1966 was no workers utopia that had rid itself of all social contradiction. In Mao’s eyes the remaining contradictions of society were contained strictly within the political/cultural superstructure, for the economic base no longer contained class antagonism. Maoist theory claimed that the superstructure was “relatively autonomous” from the base and hence a “cultural revolution” was needed to purge the revisionist leadership within the CCP. This was not a Marxist theory of revolution, but rather a populist theory that was not dissimilar from Bismark’s Kulturkamf. In no way was the GPCR a spontaneous event. After the enormous human toll of Mao’s failed policies in the Great Leap Forward much of the CCP took a more conservative stance on economic issues. Voluntaristic and extremist policies were avoided and Mao was reduced to a more symbolic “father of the country” style figure in the party, though his theories were still official state doctrine. Like the ruling bureaucracy of all the classic Stalinist nations we can see two general factions in the CCP – those like Mao who wanted to maintain autarky and a command economy, and those like Deng Xiaopeng who favored the continued existence of internal markets and gradual development. Mao had been looking for ways to purge the party of the more rightist faction years before the Cultural Revolution using internal party channels but there efforts were to no avail. Such a task would require mobilizing the masses outside the party, who had no shortage of reasons to gripe about the disconnect and corruption of the state bureaucracy. Yet it was not from the masses where the GPCR would have its origin, but from within the CCP with the founding of the Central Cultural Revolutionary Group. This group only had a limited influence with the party as it was only composed of Mao and his closest cohorts. By going outside of the party and channeling mass discontent Mao’s faction concocted a strategy to not only consolidate power but to further refine his ideological hold over the nation. It was in the summer of 1966 when the Red Guards formed. 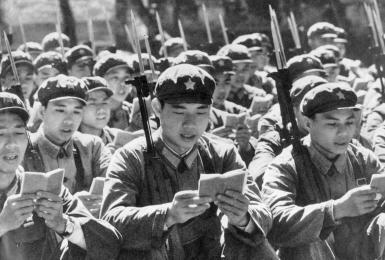 These groups of youth were united by an ideological adherence to Mao-Zedong Thought and their legitimate grievances with the CCP. Many Red Guards were the children of state bureaucrats who saw themselves as the “cream of the crop” of China, while others came from more “lumpen” backgrounds. While the Red Guards were divided into many factions, some of them gang-like, one can make a general divide between the more revolutionary and conservative Red Guards, with the more revolutionary typically from less privileged strata of society. Some factions of Red Guards found themselves attacking party committees for rightism, while other Red Guards found themselves defending party committees from supposed rightists. Eventually the movement fell out of Liu Shaoqi’s control and Mao had many of the more conservative factions of the Red Guards banned. Now that workers were engaged in struggle their demands were simply regarded as economistic for merely being wage demands. The ideological propaganda coming from Mao and cohorts now focused on attacking the “economism” of workers who were refusing to restore order. Red Guards were ordered “to take power” in Shanghai, but this was not a move to transcend the party-state but rather one aimed to quell the dissent of the working class. Millions of Chinese workers were temporary contract workers from the countryside that were denied the benefits that full time workers received, finding themselves in an economically un-stabile position. While the demands of these workers revolved around issues of egalitarianism and were essentially socialist in content they were dismissed by Mao as “rightist”. According to Maoist propaganda these workers were merely agents of rightist bureaucrats who were trying to restore “revisionism” to power. Yet it is clear these temporary migrant workers were amongst the most exploited strata of the Chinese proletariat and were voicing legitimate demands that exposed the continued existence of class contradictions in China. Mao’s orders for the Red Guards to “take power” in Shanghai was certainly a move that had more to do with consolidating authority and getting the workers to shut up than with establishing any kind of dictatorship of the proletariat. From attacking party bureaucracy in general to denouncing the “economism” of workers, Mao’s propaganda then went to urging Red Guards to “unite with all who can be united”. What this meant was making peace with the majority of party bureaucrats, for now it was just a handful of bad apples that needed to be worried about. “Narrowing the focus of attack” meant that criticism was now concentrated on Deng Xiaopeng and Liu Shaoqi and often went to absurd lengths. Any shared political positions that Mao and Liu had in the past were denied, for all positions that Liu held were inherently rightist. Focusing the political energy of the movement on attacks against Liu and Deng rather than a critique of social relations helped Mao further restore order and bring the Red Guards closer under the ideological control of his faction of the party-state. The real intentions of the movement became clearer when Deng and Liu were no longer influential in the CCP and Mao ordered an end to free transportation for Red Guards throughout the country. With the emergence of “ultra-left” currents that saw the need for actual revolutionary change Mao seemed to lose interest in the mass movements that had developed. The next step was to call in the army. After Deng Xiaopeng and Liu Shaoqui were no longer ideologically an influence in the CCP much propaganda from the Maoist Center focused on demonizing the growing “ultra-left” that took Mao’s call to rebel seriously. Any ruling group will never be able to fully establish the complete hegemony of its ideology and the Maoist bureaucracy was no exception. Army commanders aimed to fully incorporate Red Guards into the 3-in-1 committees but many refused, correctly seeing that these committees were not organs of proletarian dictatorship but class collaboration. This lead to clashes between “ultra-left” Red Guards and the army, complicated by the fact that many soldiers in the PLA were sympathetic to the ultra-left. By end of summer 67 Ultra-left Red Guards were in many cases taking the offensive, with tens of thousands of engaging in an organized siege of government buildings in Beijing for a month. By September Mao and Lin Biao made it clear that they were sympathetic to the army commanders aiming to restore order. Purges occurred and weapons were seized. The more rebellious Red Guards held off for a bit, consolidating themselves and organizing into more effective units. Others opportunistically vied for seats in the three-in-one committees. The triumph of the revolutionary committees was ultimately the triumph of the PLA and the final establishment of a military dictatorship. The following years of Chinese political history are mostly internal bureaucratic squabbles and very confusing, leading to some very bizarre foreign policy such as being the only “socialist” nation to recognize Pinochet’s Chile. It was ultimately the PLA that won out in the Great Proletarian Cultural Revolution, a vital tool for assuring that working class activity never got out of hand. It is during the GPCR years when the Chinese working class was crushed to the point where Deng Xiaopeng’s market reforms could be instituted without major resistance. Multiple 1st world leftist groups obsessed over the Cultural Revolution in the 60’s and early 70’s (see Max Elbaum’s Revolution in the Air), which seemed to coincide with events in Czechoslovakia, Paris and the US student movement. Yet the ideologies of third-worldism and the Mao cult that came to entrance much of the New Left was merely “the explosion point of ideology” to the Situationist International. For the Situationists what was occurring in China was the fracturing of the bureaucratic ruling class, a fracture that allowed the working class to assert itself as revolutionary force for the first time since 1927. Judging from much of the propaganda from the era they seem the exception to the rule, with even some Trotskyists from the era sympathetic to Maoism. The student New Left, formerly obsessed with participatory democracy, was now forming rigidly dogmatic anti-revisionist groupings, self appointed vanguards that would form what was known as the New Communist Movement.